80% of the poor in sub-Saharan Africa are smallholder rural farmers. Only 4% of the farmland in sub-Saharan Africa is irrigated, and the vast majority of smallholders depend on unreliable rainfall. They all harvest at the same time, compete in the same markets, and consequently make very little profit. With an oversupply of food after the rain-fed harvest, between 15% and 50% of these crops spoil before they are eaten or sold. However, just a few months later, during the long dry seasons, there is little food or income, and the same farmers fall further into poverty, struggling to even feed their families. KickStart’s MoneyMaker pumps enable farmers to make their own rain. They put control into the farmers’ hands, enabling them to decide when, what, and how often to grow. 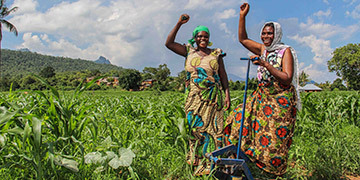 A recent study funded by the Rockefeller Foundation and conducted by Sokoine University in the Arusha area of Tanzania, found that farmers who bought MoneyMaker pumps increased both their crop production and their number of harvests per year. In the study, the number of farmers harvesting three times per year increased from 3% to 38%. Enabling farmers to harvest during the dry seasons not only provides food for their families and communities, but allows farmers to sell crops at higher margins when the supply is low and demand is high. It stabilizes their income fluctuation, stops them from falling into poverty in the next dry season, and provides them more money to buy inputs for their rain-fed crops and to invest in other money-making activities. Continuous impact monitoring studies have confirmed that the average farmer using our pumps increases their net-annual income through irrigation from $150 to $850 and increases their total net-annual farm incomes by 400%. For the first time, many families can send their children to school or to an improved school, afford proper healthcare, save money, and invest in other businesses to ensure they do not fall back into poverty. To date, more than 160,000 farmers across Africa have used MoneyMaker pumps to start profitable farming businesses, which have enabled 800,000 people to take the first major step out of poverty. These farming families now generate $140 million in profits and wages each year and grow enough produce to meet the fruit and vegetable needs of between 9 to 11 million people. Women comprise the majority of the agricultural workforce in sub-Saharan Africa. However, they face a harsh reality as they have substantially less access than their male counterparts to agricultural technologies, farm inputs, land, capital, credit, and education. Bridging the gender gap and empowering women holds the potential for huge economic growth and transformative impacts for families across the continent. KickStart is closing the gender gap and empowering women and entire families with our irrigation pumps. We do this by conducting women-focused outreach, partnering with organizations working with women farmers, and offering micro-financing solutions that enable more women to adopt pumps. KickStart has developed and continues testing new pump financing programs in Kenya in an effort to reach a poorer segment of farmers and more female farmers. Both our Mobile Layaway program and our new Rent-to-Own programs have proven successful at increasing the number of women who adopt MoneyMaker pumps. This year, we found that 50% of farmers who registered for a Rent-To-Own payment plan were women, compared to only 12-14% of buyers who purchase pumps with cash. Women who adopt KickStart’s pumps earn more income, have a greater say in financial and family decision making, and often reinvest their earnings back into their families with a higher propensity than men. Our efforts are helping women strengthen their positions within their households and their communities and enabling them to become successful entrepreneurs. Climate change is an increasing threat across Africa and it disproportionally affects those who have done the least to cause it – smallholder farmers. Increasing variability of rainfall due to climate change is putting their very livelihoods at risk. By enabling farmers to access water all year long with our irrigation pumps, KickStart helps smallholders reduce the risks they face as a result of ongoing climate change. No longer relying on natural weather patterns to grow crops, smallholder farmers who adopt MoneyMaker pumps are empowered to withstand erratic rainfall patterns, and safeguard their crops against future drought and other climatic emergencies. With funding from the Rockefeller Foundation, Sokoine University of Agriculture in Tanzania looked at the impact of KickStart’s pumps on farmers in Northern Tanzania. It compared production of, and income from, horticultural crops such as tomatoes, kale, and Chinese cabbage (between 2008/09 and 2011/12) before and after the farmers bought a MoneyMaker pump. The study uncovered that overall, practicing small-scale irrigation and using KickStart’s MoneyMaker pumps builds smallholder farmers’ resilience to climate change, enabling them to continue cultivating into the dry seasons and fair far better than their neighbors. KickStart and the Barr Foundation partnered in part to help smallholders increase their resiliency to climate change and plant and grow tree seedlings to both promote soil health on their own farms, and aid in the reforestation of the Rift Valley region of Kenya. The number of farmers growing tree seedlings in the Barr project area increased from 82% at baseline to 92% in the 18-month follow-up. Additionally, the average number of tree seedlings planted annually by these farmers increased from 148 per farmer at baseline to 413 per farmer in the follow-up survey. Despite the proven benefits and relatively low cost of KickStart’s pumps, they are still beyond the easy reach of many poor farmers. To meet this need, KickStart continued to explore new financing options to facilitate pump adoption for a larger segment of farmers. This year, KickStart developed, piloted and tested a new Rent-to-Own (RTO) model and recruited over 150 farmers in Kenya to sign up for the service. We continued to refine and adjust the model based on farmer feedback and our analysis of the program’s performance. In the final model, the farmer registers for the financing program and pays a small non-refundable fee in addition to a 20% deposit which counts as the first month’s rent. They then use mobile money payments (prompted by SMS messages and phone calls) to pay a 10% rental fee per month for the next 2 months, then larger and final payments in months 4 and 5, after they have started to harvest and sell their crops. The total price of the pump to the farmer covers the administrative costs and a risk adjusted premium to ensure that the service is sustainable. About 50% of participants in the RTO pilot have been women, indicating that it may be a key mechanism to empower more women to adopt MoneyMaker pumps and take up irrigation. KickStart’s Mobile Layaway service has also continued attracting new farmers this year who have used MPesa’s mobile money platform to save money to purchase MoneyMaker pumps. Over 350 farmers have used this service since KickStart successfully piloted it two years ago. From farmer feedback, we learned that there is still a general lack of trust in mobile savings in Kenya which offered some insight as to why the program has not spread more quickly. Similarly to the RTO model, Mobile Layaway has enabled more women to save up to purchase pumps and also provided opportunities for pump adoption among a poorer segment of farmers. Last year, KickStart was awarded a grant from USAID’s Development Innovation Ventures to further test both of these micro-financing innovations through a randomized control trial in Kenya. We will measure differences in up-take, the poverty levels and gender mix of the pump buyers using the different services, and the relative impacts of the pump among these buyers depending on the purchase method. We launched this trial near the end of this year with researchers from Washington State University and we look forward to tracking its progress in FY 2015. In addition to our in-house financing solutions, KickStart continues to explore partnerships with micro-finance institutions to offer financing alternatives to smallholder farmers. We were excited this year to establish a partnership in Kenya with Small and Micro Enterprise Programme (SMEP), the 3rd largest microfinance institution in Kenya, and have continued to engage with other potential partners to open up new financing opportunities for farmers to acquire pumps. KickStart is changing the way the world fights poverty, and with that comes a challenge. We sell never-before-seen, big-ticket items to some of the hardest-to-reach, poorest, and most risk-averse people in the world. They live far off the main road, they are reluctant to change the way they have been farming for generations, and convincing them to spend their hard-earned money is difficult. We call this the “Last Mile Challenge”. To overcome the “Last Mile Challenge” KickStart has recognized that new, innovative solutions to marketing and distribution are necessary, and we constantly develop new ways to market and promote our tools. Recent examples include our increased work through partnerships, the development of our community ambassador’s model, and our agropreneurship training program. KickStart launched our Global Institutional Partnerships (GIP) program in 2005 to expand our impact beyond our country programs. Through the GIP Program we partner with NGOs, CBOs, Governments and private sector players who already work with smallholders on the ground across Africa, and we encourage them to incorporate irrigation and our pumps into their programs. Since its inception, the GIP Program has grown rapidly and today accounts for about half of our pumps sales. Incorporating high-quality, low-cost irrigation pumps into the work of other organizations creates large and immediate impacts in programs that already work with farmers in Africa, and these partners achieve this with a low marginal cost. Based on our GIP programs success, KickStart is now putting more focus on working through these types of partnerships to significantly scale our impacts. One of KickStart’s most significant partnerships is with Total LandCare (TLC) which serves as a prime example of how this aspect of our work has grown. 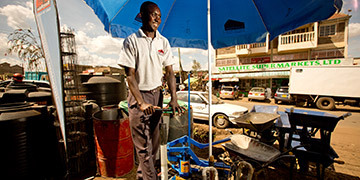 We began the partnership in 2006, when TLC started incorporating our pumps into their programs with smallholder farmers. KickStart has worked closely with TLC staff, providing them with pump demonstrations and trainings to teach farmers how to use and maintain the pumps. To date, the partnership has enabled 22,000 farmers to adopt pumps and helped them to lift their families out of poverty. In FY14, KickStart began piloting a Community Ambassador model in Kenya with the support of Greater Impact Foundation. Through this model, we identify respected community members who live in areas where we work and who believe in our products. We then appoint them as MoneyMaker Ambassadors. These ambassadors help to promote our pumps by organizing groups of farmers in their area to attend demonstrations and training on how to use the pumps. The community ambassador program has helped our field staff to reach many more farmers, and based on its success, we now plan to expand the program across Kenya and in our other country programs. KickStart and The Western Union Foundation partnered in 2013 to develop and pilot an innovative farmer training program on business skills and agricultural best practices—or Agropreneurship. The goal of Agropreneurship training is to increase farmers’ understanding of the benefits of irrigation and their income potential through looking at farming as a business. The program also aims to ensure maximized impacts for individual farmers in terms of increased crop yields and income generation. This year, KickStart trained 34 of its field representatives in Kenya on Agropreneurship, as well as its team leaders and sales managers. The training involved in-classroom lessons and field days during which representatives received hands-on instruction. KickStart’s agronomists trained the field reps on not only how to teach farmers to irrigate, but also how best to plant, cultivate and harvest their crops to maximize their yields and incomes. Since the training, these field reps have begun using their newly acquired knowledge to train farmers directly. Many field reps report that since the training, they are more confident to go out and train farmers on agricultural best practices, answer farmers’ questions, and that it has helped increase their ability to influence pump adoption. Solar Pump: Solar electricity is getting cheaper every year, and it is only a matter of time before solar water pumps become an affordable method of irrigation for smallholder farmers in Africa. With this in mind, KickStart began developing and testing a low-cost solar powered irrigation pump that will enable farmers to pull water from deeper depths than our existing human-powered MoneyMaker pumps using only energy from the sun. This year, KickStart developed and field tested a number of prototype solar powered pumps and made good progress on substantially lowering the costs compared to competing models on the market. Solar power, however, is still relatively expensive, and while our aim is to develop the lowest-cost solar pump, inevitably it will still be relatively expensive for most poor farmers. To address the cost barrier, as KickStart refines its designs, we will continue exploring options to incorporate a remote shut-off mechanism into the pump design. This will allow KickStart to more easily facilitate financing on the product through a rent-to-own model, making the solar pump more accessible and affordable to poor farmers. KickStart is continuing to refine this technology and we plan to begin market testing our first solar pumps in FY15. Starter Pump: KickStart began developing a new manually-powered pump model: the Starter Pump. This pump is being designed to target an even poorer segment of farmers than our current models. KickStart intends for it to retail for about half the cost of our lowest-cost pump, the Hip Pump. The Starter Pump will offer poor farmers an entree into irrigation. As they grow their farms and earn more money, these farmers will then have the opportunity to upgrade to the next level of irrigation and farming. Though it is intended to be a very low-cost solution, the PID team is developing the Starter Pump to meet our rigorous durability and efficiency standards, and to still align with the rest of our design criteria. – Alan Spybey, Director of PID, KickStart International. Watch highlights of the PID team’s trip here.